Detroit, Michigan, circa 1910. "Approach to the Detroit River tunnel." 8x10 inch dry plate glass negative, Detroit Publishing Company. View full size. Submitted by Papa Bear on Mon, 09/24/2018 - 12:56pm. Submitted by Dave on Sat, 09/22/2018 - 7:37pm. Click here for an extreme close-up. Submitted by LarryDoyle on Sat, 09/22/2018 - 4:27pm. Yes, GeeBax, this was a third rail system, and the power rail is seen 2' 4 1/4" outside the running rails to your left of the engine. The small pantograph was used in terminal switching areas where an overhead power supply was placed above complex track arrangements such as slip switches and double crossovers which made it difficult, or impossible, to place third rails to assure continuous power supply to locomotives. Submitted by DaveA on Sat, 09/22/2018 - 1:45pm. While the tunnel track on the right has the third rail in shadow, you can see it pretty clearly on the other side, to the right of the incoming electric engine. The Detroit tunnel operation was with 600V DC until the diesel electrics took over. Submitted by GeeBax on Fri, 09/21/2018 - 5:02pm. There does nor seem to be any overhead power feed to the electric locomotive, even though it has a very small pantograph. Was there third rail power in the tunnel? Submitted by indydad on Fri, 09/21/2018 - 4:53pm. 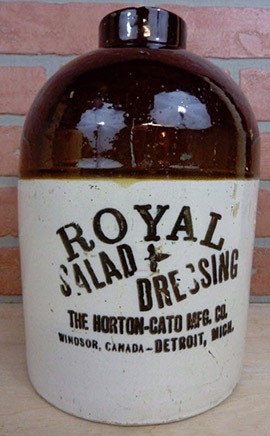 In the center background you can see the rooftop sign for Royal Salad Dressing. It was mde by Horton-Cato Mfg. Co., which was founded by two English gentlemen (hence the "Royal") in Detroit in 1877. They also made Worcestershire sauce. Submitted by Angus J on Fri, 09/21/2018 - 4:07pm. 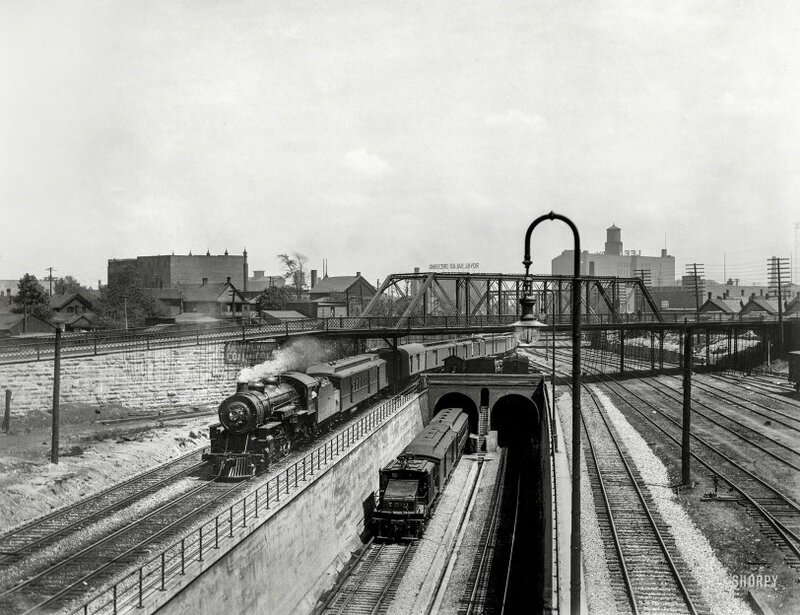 This railway tunnel from Detroit to Canada is still in use, although steam and electric engines have been replaced with diesel-electric locomotives. 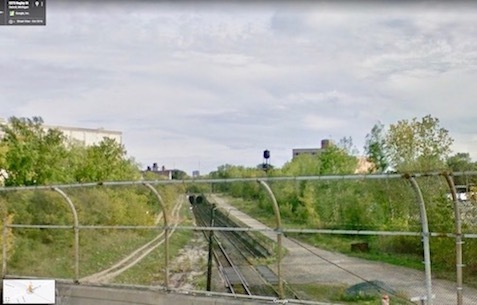 Not far away is the infamous Michigan Central Station, which is to be restored. You can check out photos of the station here. Submitted by DeeGee on Fri, 09/21/2018 - 2:59pm.